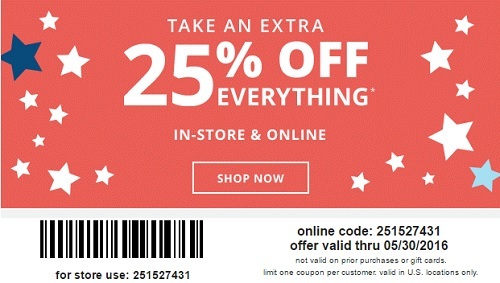 Visit any Payless ShoeSource store location in the U.S. or Payless ShoeSource online and get an extra 25% discount on everything you buy! If you want to take an advantage of this offer you must print a special Memorial Day Savings coupon which is available through Payless ShoeSource emailing and show it during the time of your purchase at your nearest Payless ShoeSource store location. Offer is also available online with promo code. Source of the information is Payless ShoeSource. For more details visit your nearest store location or official website.